"The Eye of Sauron," as someone called it. 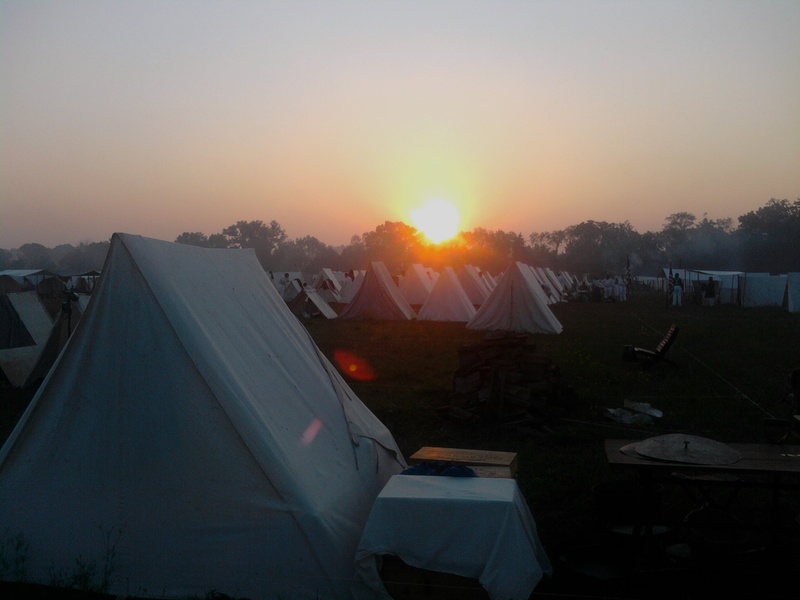 The sun rises over a sweltering camp. A major milestone has just passed: the 150th anniversary of the First Battle of Bull Run and the biggest reenactment of this first year of the Civil War sesquicentennial. Thousands of reenactors (numbers I’ve read vary between 6,500 and 8,000) turned out to participate in this event. My company from Massachusetts was there. Challenging as it might have been, it was also highly rewarding. Let’s get this fact out of the way first and foremost. It was hot. Punishing hot. Angry hot. Literally candles-melting-in-lanterns-without-any-flame-hot. This disrupted things somewhat and required some compromises. I heard from an EMT that it reached 107 degrees on Friday with a heat index of something like, I don’t know, 451 degrees. At least it felt that way. It was certainly the hottest weather I’ve ever been in and although I certainly wasn’t happy with the heat, I drank absurd amounts of water and gatorade and made it through feeling tired, but well. Our company, I’m very grateful to say, did not suffer any heat-related illness. That was certainly a plus. The answer is not easily put into words. Perhaps a good place to start would be the experience that we provide for the spectators. After the fight on Saturday, I meandered (very slowly) down sutler row, chugging hot water from my canteen and looking to purchase a few things…including a new shirt which would absolutely be needed. Nearly every spectator I passed thanked me profusely just for taking part in the event. I don’t think I’ve ever been thanked so much in my life. One, whom I shall not forget, was an older woman who told me with tears in her eyes that her three times great grandfather had been killed in the First Battle of Bull Run and that the reenactment had given her some sense of what the battle might have been like for him. Although perhaps her praise was too generous, the fact that these events can have such an effect on people is a pretty good reason to show up and do what we do. Another piece of the picture is something, I think, that is shared by every reenactor: a desire to personally understand, even if in some vague and imperfect way, what it might have been like for those soldiers. The heat certainly gave a lot of us a new appreciation for that. It was mighty hot on July 21, 1861 also…perhaps not as hot as 2011, but close enough. There were also some moments during the battle on Sunday that had a surprising degree of realism. One was the “skedaddle” of our battalion. The 5th Massachusetts Infantry was there, at the base of Henry Hill, next to Rickett’s Battery, before the counter-attack. Their regimental history speaks of the dashing charge they made to the foot of Henry Hill, executed with such order under fire that an officer from another regiment mistook them for Regulars. But not long after, the 5th Mass was driven from the field along with the rest of Franklin’s brigade. In describing the retreat, the regimental historian, Alfred S. Roe, is understandably concise. “The Fifth left the field in some confusion,” Roe wrote, “mostly by companies, but was soon together again under the command of Major Boyd.” He is quick to point out that, once the regiment crossed back over Bull Run at Sudley Ford, they formed a battle line and stacked arms…not every regiment ran all the way back to Washington as myth would indicate. It is the “some confusion” part wherein lies an untold story. I can’t blame Roe for leaving such details out of the narrative. But it leaves one to wonder, how did things so quickly fall apart? What did it look like and feel like for things to go so suddenly and horribly wrong? We got some small sense of that at the reenactment on Sunday. Our battalion, which at that time was supposed to represent the 1st Michigan Infantry, advanced steadily across the field and, after standing by during an artillery duel (or “halftime” as we referred to it) we advanced up a slope that represented Henry Hill to meet the Confederates. We blazed away at each other for a time. Then, quite suddenly, knowing that we were supposed to be routed, a very large number of our battalion hit the ground with such coordinated timing it seemed planned. Those still standing looked down at them in shock for a moment. And then the battalion broke and ran. I don’t know if the Colonel gave the order to retreat. If he did, I did not hear him. Something about it seemed very real and unaffected. An inexperienced regiment suddenly taking heavy casualties, a moment of stunned horror, and then discipline vanishes as instinct takes over and men run. I suppose “some confusion” looked something like that. That moment left me chilled, despite the heat. It was just one of several remarkable episodes during Sunday’s engagement and an experience I’ll not soon forget. I think the event overall was a great success. The commanders clearly put a great deal of effort into representing, as well as circumstances could allow, the movements of Porter’s, Burnside’s and Franklin’s brigades on Henry Hill. The 150th cycle, I think, is off to a very good start. And I am relieved to hear that the big events for next year will take place in the spring and fall when, we hope, the temperature will not be 107 degrees.